I've been suffering with a cold virus for the past week so the fishing's been a bit restricted. After the recent warm spell it has at last decided to turn wintery so, yesterday afternoon, when I decided to go fishing it was sunny and clear but pretty chilly. 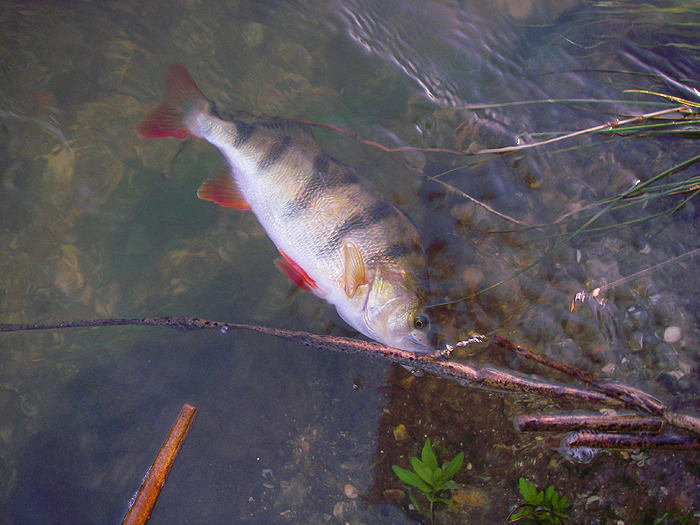 I had a box of maggots that I needed to use up so I opted to try and catch some small livebaits to use for perch. Needless to say the sudden drop in temperature was a killer and after twenty minutes and three different spots without even a minnow bite I was beginning to get the message. I decided at this point to cut my losses and try spinning. I was at the tail of a large pool which seemed a reasonable place to start my operations so I swapped the little paternoster trace for a size 4 silver Mepps. I was using my little Teklon rod with 15lb braid and a short mono trace so it was more or less my usual river-spinning tackle. I flicked the lure up and across the pool a couple of times just to ease the line off the spool then I made a long cast. The lure was about half way back and I felt a tap which I was pretty sure was a fish but it didn't stick. The next cast was to the same spot and sure enough at almost the same point I was in and felt the bump, bump, bump of a decent perch on the end. 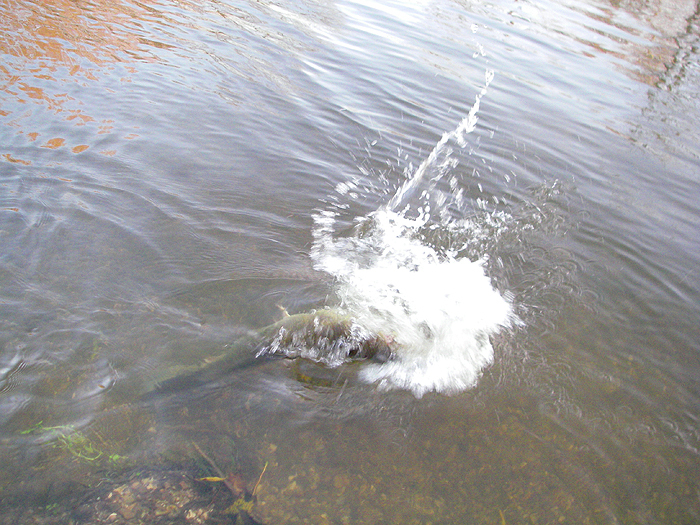 I reeled the fish in and took one or two pictures before releasing it without lifting it from the water. "Better than nothing!" was my thought. Two or three casts later there was a heavy pull and this time the fish took line against the clutch. Clearly it was no perch and I had a fair old struggle before I was able to unhook and release a nice pike of six pounds or so. Excellent! At this point I was feeling well satisfied with my afternoon's sport. The sun was beginning to sink below the trees and it was noticeably cooler on the fingers. 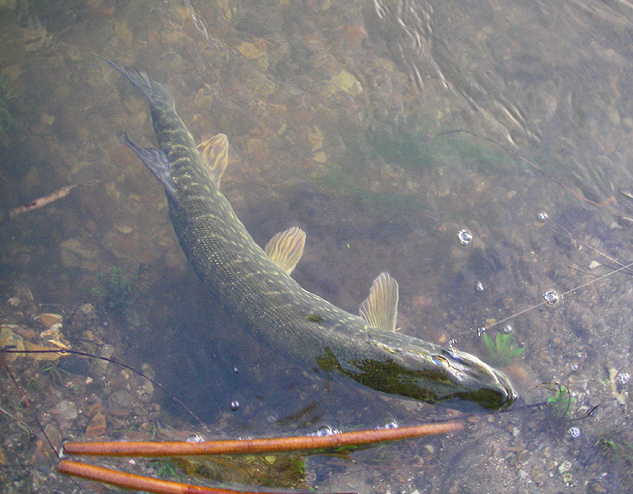 I fanned the next few casts across the pool until I reached the spot where I'd had the pike. There was a sudden heavy pull and again I was into a decent fish. This one thrashed the surface to foam and jumped a couple of times before I could bring it close enough to reach down with my pliers and remove the hook. 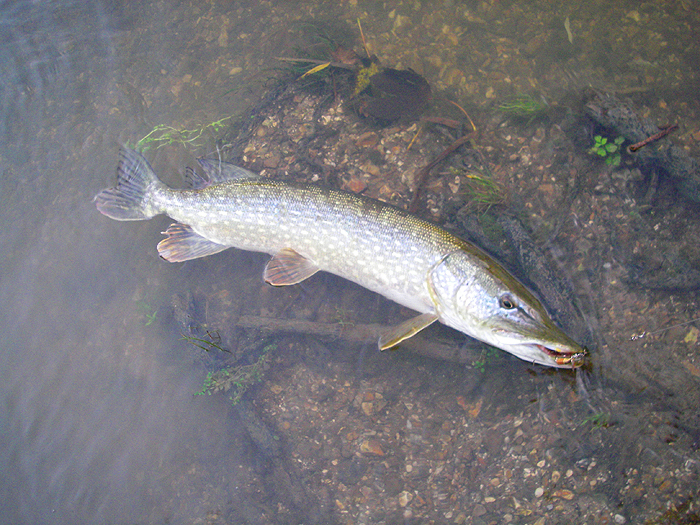 It was quite a lot bigger than my first pike - near ten pounds I guessed - and it swam away strongly as I picked up my bag and livebait rod to walk back to the car. No livebaits but a very enjoyable session.